The rock pools in Priest’s Cove were the primary focus during our week at Brisons Veor. 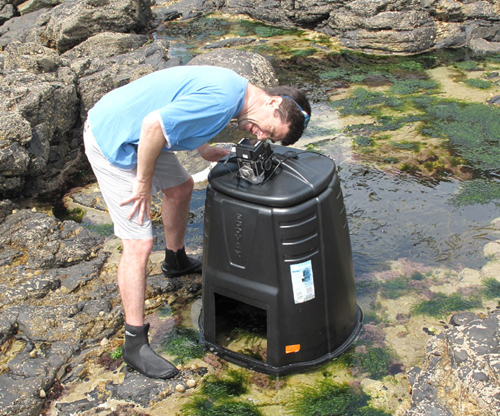 Martin had prepared a compost bin as a portable photo studio to control the light reflections when photographing the rock pools. I made the downstairs studio into a dark room. Martin worked outside during the glorious week of sunshine we had, while I was tucked away in the dark. The first couple of days were frustrating for both of us, photograms can be easy and quick to make but become so much harder when one wants to instil a range of tones and some subtlety. Both of us were trying to capture the jewel-like qualities of the rock pools. 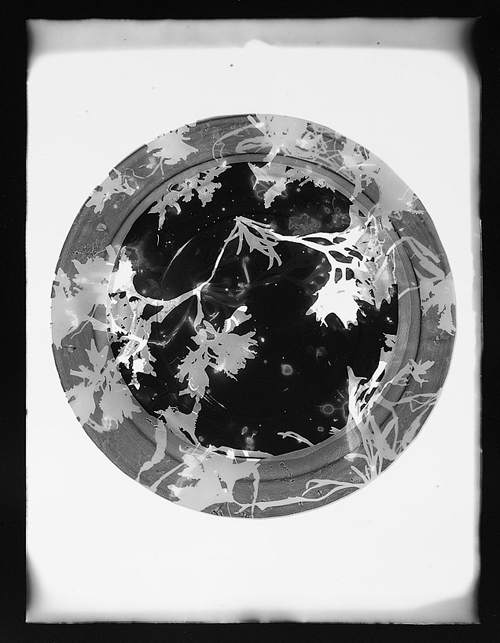 After initial tests with seaweed it became clear that my photograms needed structure – to this end I used a glass bowl. The shape was reminiscent of the bottom of a bucket but also of the round porthole windows at Brisons Veor and microscope images. 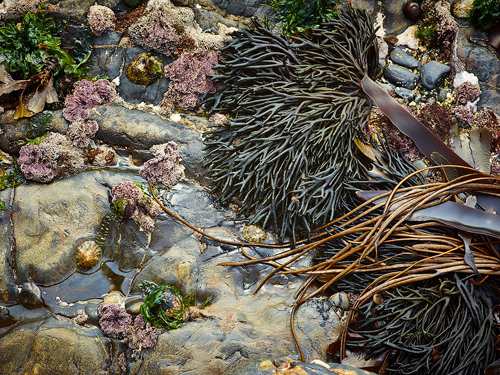 I wanted to make portraits of the huge range of seaweeds, for example landlady’s wig and bladder wrack. The names themselves are often comic and seem to conjure up another world. 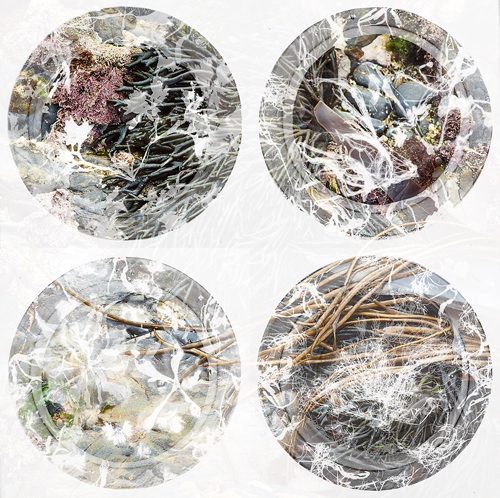 Martin and I wanted to find a way to combine our two responses to the rock pools, with the result that we each selected work and combined them into a final set of images that referenced Victorian vignettes or embroidery in “Seaweed Vignettes.” This was a surprising outcome as I had assumed that our work would remain as separate responses to the same subject matter. 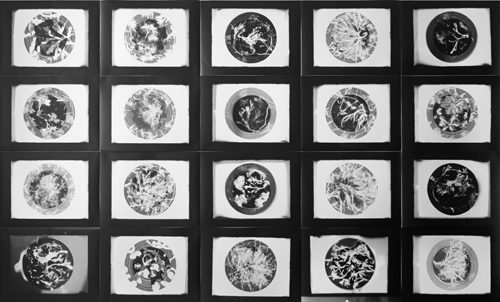 A further outcome was a video combining my photograms and Martin’s photographs and a wall installation of “20 Portraits of Seaweed” (work in progress), and experiments with liquid light.These images are very much the beginnings of something rather than the conclusion. 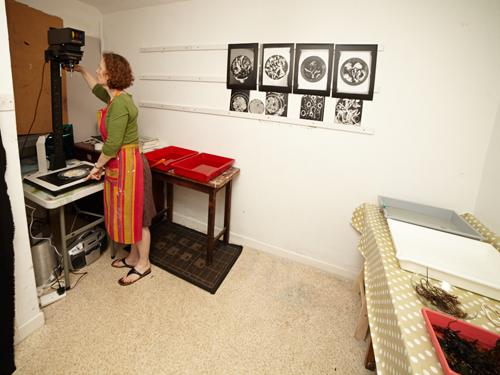 We are launching a biennial photogram competition/exhibition with work being exhibited at both Salisbury and London venues. There will also be a joint exhibition of our work in Salisbury, August 2013 with artist talks.